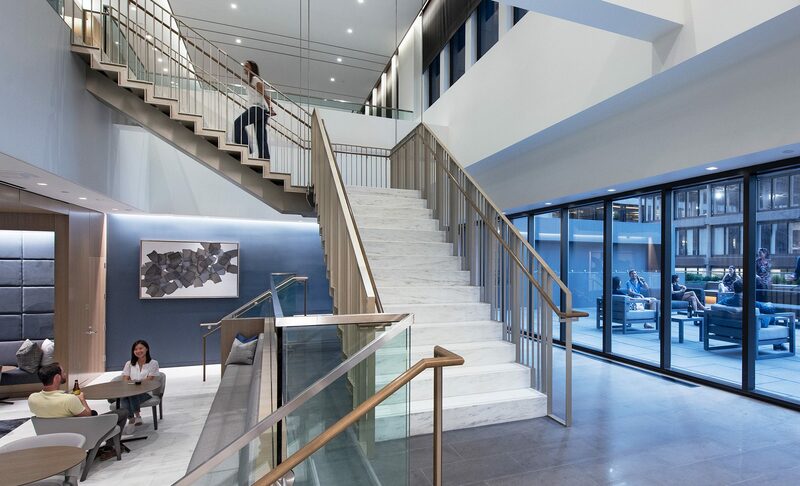 Working with the project architects, CRJA-IBI Group provided full design services for this 2,875 SF rooftop terrace located on the mezzanine level of 100 Federal Street in Boston’s Financial District overlooking Post Office Square Park. 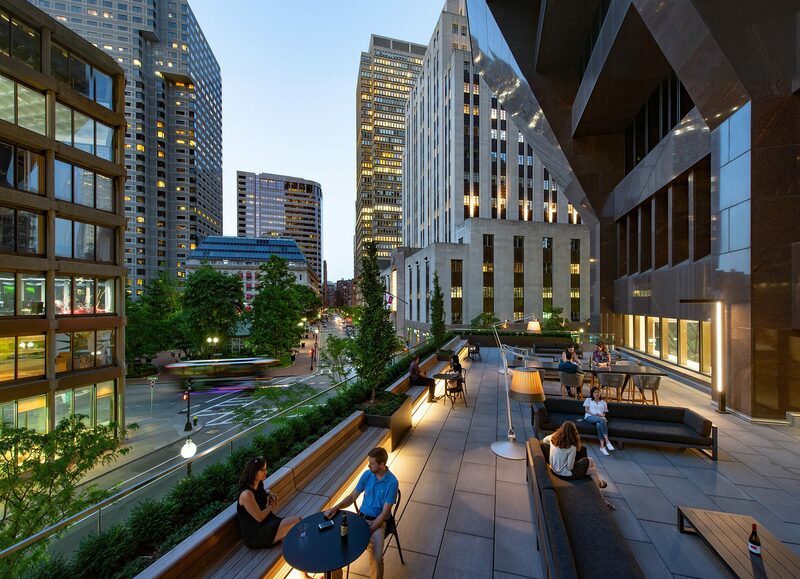 The goal of the project was to create a highly flexible outdoor client entertainment space for one of the Boston’s largest financial services companies. As an extension of the newly designed interior entertainment space the roof terrace provides direct access to the sights and sounds of the bustling downtown from serenity above. The space was designed to be minimalist in nature with a monolithic ground plane surrounded on three sides by perimeter planters and glass railing. A custom ergonomic wood bench lines the far edge of the space providing diverse seating opportunities along with the lounge furniture configurations. 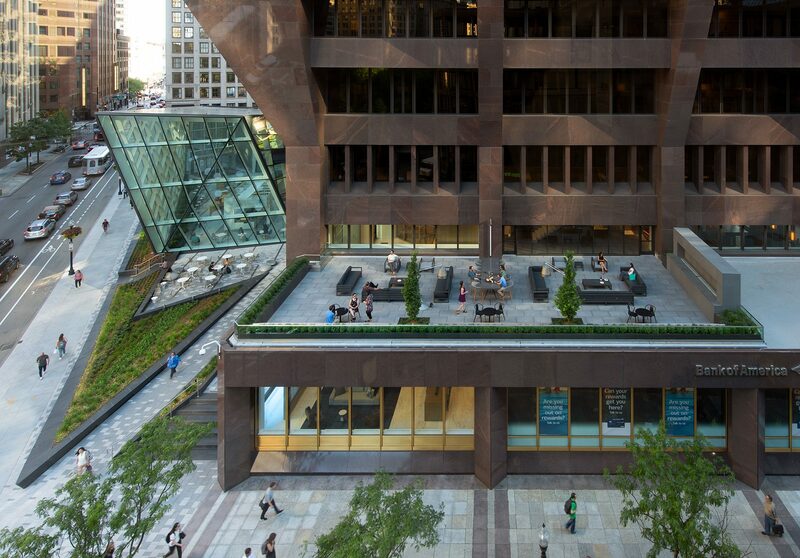 The bench under-lighting provides subtle illumination for users along the perimeter of the space while the oversized sculptural desk lamps and linear light at the building column provide ambient light for the main focal areas of the terrace. A linear firewall was designed to be viewed as a backdrop from both the interior spaces and exterior Congress Street side of the terrace. It is also a visual focus as a counterpoint to the view of Post Office Square, and fosters social engagement as people gather around the warmth and play of light.